Toyo Keizai Inc., established in 1895, is one of Japan’s largest and most established publishers producing magazines and books focusing on economics, management and business. 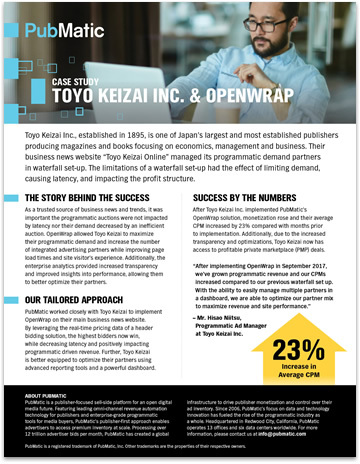 Their business news website “Toyo Keizai Online” managed its programmatic demand partners via a waterfall set-up. The waterfall system of header bidding limited, however, limited their demand, caused latency, and impacted their profit structure. To improve their monetization, efficiency and user experience, Toyo Keizai looked for a header bidding wrapper solution that would address their biggest pain points. Discover how the implementation of PubMatic’s OpenWrap solution improved their average CPM, increased transparency into the auction dynamics, and allowed for improved optimization in this case study.